Facebook provide lot of stuff for third party websites and blogs for seamless integration with Facebook platform and its users. While blogs and websites have been using Facebook like button extensively on each articles page, it has new companion in the form of Facebook Send button. There are also Facebook widget boxes that show photos of Facebook followers and list boxes displaying recommended article listing. Are you tired of all this and want to remove this to surf websites, blogs without Facebook buttons and boxes? 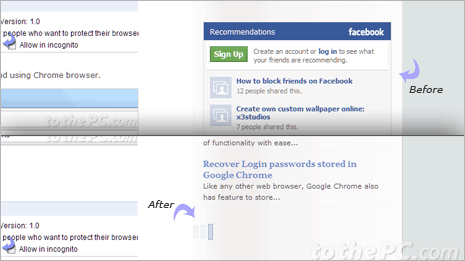 Facebook Blocker is very easy and neat way to disable Facebook stuff while you browse your favorite blogs and website. It is a web browser extension that can disable Facebook Social Plugins like like button, send button, recommendation lists, Facebook profile widgets and so on. 1. 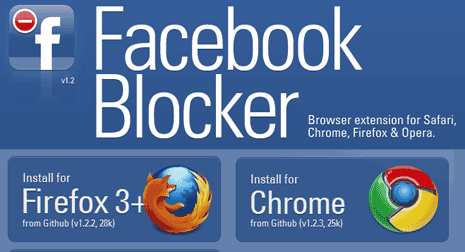 Open Facebook Blocker website for downloading extension to disable Facebook like button and widget boxes. 2. Then click to select web browser you use for surfing internet among: Google Chrome, Firefox, Safari and Opera. 3. Clicking the respective browser button will ask you to download specific Facebook Blocker extension. Install the extension plugin or addon and restart the browser (if you get prompt for the same). 4. After the extension install, open your favorite websites and blogs – you should see empty space in place of like button or Facebook widget boxes. What about Facebook Connect Sign-in :Fortunately, this blocker extension does not disable sign -in via Facebook Connect on websites or blogs using it. Hence, you can safely use it to remove Facebook annoyances including like button, facebook profile widget, recommendation boxes without losing ability to sign in using Facebook profile to interact.